Risaku is a small restaurant in Sendagi near dango-zaka where you can eat onigiri in all kind of flavours. They offer it as a complete meal together with some soup and side dish. The Japanese kitchen has a large variety of foods. One famous and simple snack item is onigiri (rice balls). You can get them at any konbini (convenience store) all over Japan, and easy way to keep you going. It is quite rare to see them being served at a restaurant though. Onigiri come in a triangular or cylinder shape and are often wrapped in nori (seaweed). Traditionally, they are filled with a salty or sour ingredient that acts as a natural preservative such as pickled ume (umeboshi), salted salmon, katsuobushi, kombu or tarako. Onigiri date back 2000 years to the Yayoi period (200 BC – 250 AD) when grilled rice balls out of sticky rice were made. They are billed at this restaurant as a Japanese soulfood. The various choices of onigiri. Each rice ball is made fresh and you can choose from 28 different types (see photo above). 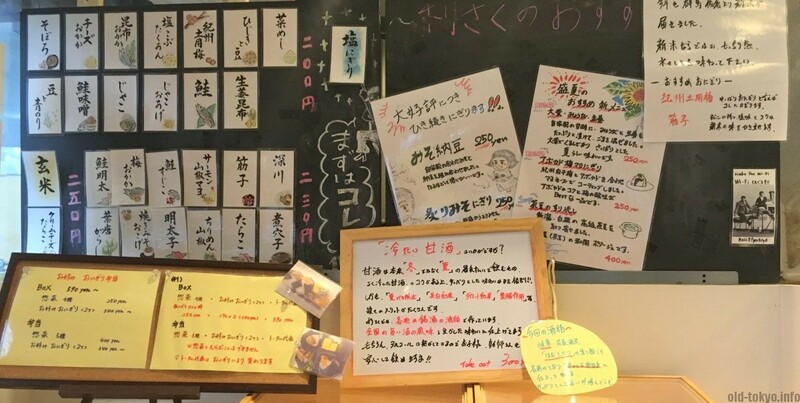 You can choose for very basic ones such as with shake (salmon) and mentaiko (marinated roe of pollock and cod), but you can also go for more adventurous types such as yakimiso okoge (baked miso) or cheese. You have also the option to take genmai rice, which means unmilled brown rice with a bit of nutty notes. While the main contents of the onigiri are mostly fish-based, you can also opt for soboro, which is ground chicken simmered in sweet soy sauce. If you are very new to all this, I would recommend either the salmon, ground chicken or baked miso. The entrance of the shop, cat-themed. When I visited this place I was expecting just some simple onigiri with perhaps a small side dish. I was happy to find that there were many side dishes next to the onigiri, which made the eating experience very rich. But above all, the onigiri (I had the Yakimiso okoge) was amazingly delicious. Be sure to also get some soup. This will cost you an additional JPY 200 at lunch time. Please note that is is very likely you need to line up at lunch time during the weekend. When to best visit? All year round, best for lunch. Can get crowded at lunch time during the weekend. Places to visit or things to do in the area? Right in the Yanesen area, very close to Snake road (hebimichi).